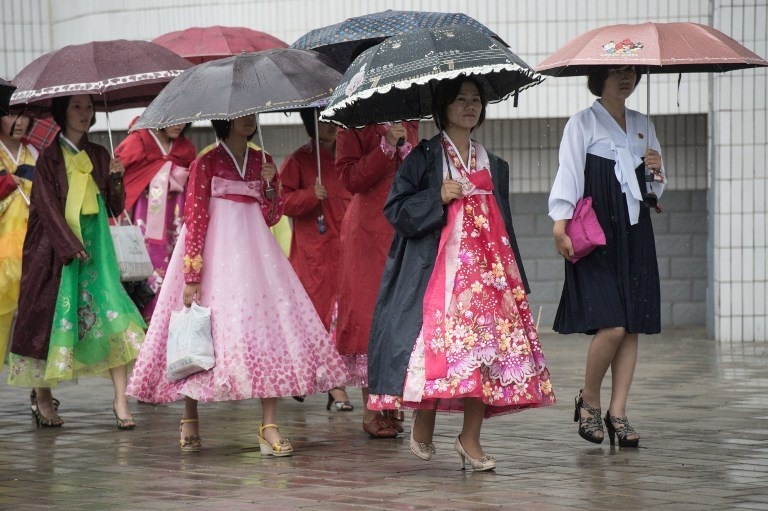 North Korean women wearing colorful dresses walk along a street in central Pyongyang, July 28, 2013. A deadly motorcycle accident involving drunken female college students linked to gambling and drugs in North Korea’s capital Pyongyang has led to a government campaign to promote “woman’s morality” in the reclusive nation, according to sources. Several women were killed in the accident in early August when a car plowed into the computer-college students riding their motorcycles in groups, the sources said. “Because this incident was reported to the authorities, women’s ‘lifestyle problems’ became a topic for discussion,” he said, speaking on condition of anonymity. No other details of the accident were available but it has led to a nationwide moral reform campaign for women by the powerful ruling Workers' Party, sources said, adding that the lifestyle of female students has come under greater scrutiny. One source said crackdowns following the accident include prohibiting women from driving motorcycles because they have increasingly “violated social order” by driving drunk or in groups, and without proper licenses, the source said. Propaganda material circulated from mid-August has warned of the need to battle against women’s involvement with “alcohol, tobacco, gambling, drugs, and prostitution,” a source in North Hamgyong province, also bordering China, told RFA. One packet of material was titled “Let us follow a socialist lifestyle to uphold the decency of North Korean women,” the source said, also speaking on condition of anonymity. Discussions at a recent educators’ conference in the province have also addressed issues and problems relating especially to female students, the source said. The source said “if women are found riding a motorcycle alone, police seize their motorcycles and fine them about U.S. $50,” the source said. “In the past, North Korean authorities showed forbearance when dealing with crimes committed by women, but from now on I think they will handle these things more strictly,” the Jagang source said. Ownership of motorcycles in impoverished North Korea is widely considered a status symbol as most people still depend on the public transportation system. Last month, two websites in South Korea that carry reports from sources in North Korea said that authorities there had cracked down on private motorbike use in order to conserve fuel for military and government officials, according to The New York Times. The restrictions could not be independently verified. Reported by Sung-hui Moon. Translated by Hanna Lee. Written in English by Richard Finney.